​education and ﻿empowerment﻿ in critical areas worldwide. In August 2017, Bond Street Theatre initiated an ongoing project in Malaysia working with refugee and migrant populations. Malaysia is not a signatory of the UN Convention on Refugees, leaving the country's refugees extremely vulnerable. Partnering with Asylum Access Malaysia, the Rohingya Women's Development Network, and Masakini Theatre, BST developed theatre-based tools to share accurate rights-based information with refugee groups in the Kuala Lumpur area. The project has resulted in the creation of two brand new theatre troupes. We are grateful to Rational Games Inc. for making this project possible. BST has launched a multiyear program to inform citizens about their legal rights and protections through theatre performances in schools, markets and locations where people congregate. Currently, much of the country relies on traditional councils for dispute resolution, with outcomes that can be arbitrary or overly harsh. The program, supported by the US Institute of Peace, promotes fair and equal access to justice. The project builds on our recent community improvement program, which engaged 400+ youth in 25 provinces in creative, constructive activities that counter violence among youth and improve their communities. As US Embassy Arts Envoys in India, BST created a dramatic performance with Bangladeshi and Indian actors, musicians and dancers that illuminated the tragedy of borders, and presented the show in border villages, including Petrapole, a major border checkpoint. Tears streamed down the faces of those in the audience old enough to remember the 1947 partitioning of India and Bangladesh, which tore apart families and friends. Today, Bangladesh and India share the fifth longest border in the world, dividing towns, farms, and even homes. Through the play, we reminded audiences that people suffer on both sides and that we are all the same. Bond Street Theatre is the recipient of a MacArthur Award for its innovative cultural programming. ​The company has a 5-star rating on Guidestar, has been TOP RATED by Great NonProfits, and is an NGO in association with the United Nations DPI. Above, ART/NY's Executive Director, Ginny Louloudes introduces Ms. Sherman. In 2018, BST's Artistic Director Joanna Sherman was honored by the Cooper Union Alumni Association with the Peter Cooper Public Service Award, and inducted into the Cooper Union Hall of Fame. 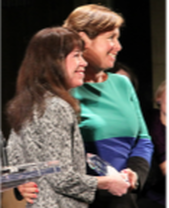 Above, Pennie Ojeda, former head of International Programs ​at NEA, presented the Award to Mr. McGuigan and Ms. Sherman. BST has been awarded an Otto René Castillo Award for Political Theatre. We are honored to receive recognition for our years of creating theatre for social change in conflict areas around the world. Above, Ambassador Cynthia P. Schneider presents ​Ms. Sherman with the Award at the March gala. 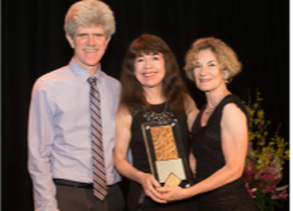 Artistic Director Joanna Sherman received the League of Professional Theatre Women's Lee Reynold Award in honor of Bond Street Theatre's work for social justice around the world. "Agents for Change", an upcoming documentary produced by Michael Carson Productions. View our interactive map to explore our projects around the world. ​Our photo book, A Decade is Afghanistan, is now available in our shop! The photos and quotes inside celebrate ten years of humanitarian-artistic work in the field. Artistic Director Joanna Sherman's account about the lives of Afghan girls is featured in a chapter titled, "The New Storytellers of Afghanistan" in this beautiful new book, available from the University of Texas Press.